Spider-Man's alleged involvement in the murder of Joey Z, a local thug, had prompted the Daily Bugle to up the bounty on the wall crawler's head to $5 million. It appears as though Norman Osborn's personal war on Peter/Spider-Man is going flawlessly. While Osborn enjoys the opulent lifestyle among New York City's elite, Spider-Man can't even show his face in public without some gun toting psychopath looking to collect the bounty on his head. Not to mention Norman has been safely distancing himself from the belief that he is (or ever was) the Green Goblin all the while leading a bogus effort to find the "real" person behind the Goblin mask. Norman's deception persists through the Spider Hunt saga, a four part crossover that linked all four major Spider-Man titles at the time. The first installment of the saga begins in Sensational Spider-Man #25, where Dr. Angst (aka Dr. Jonas Meuller) is nearly finished preparing some unknown individual to become the next Green Goblin (aka Green Goblin V). 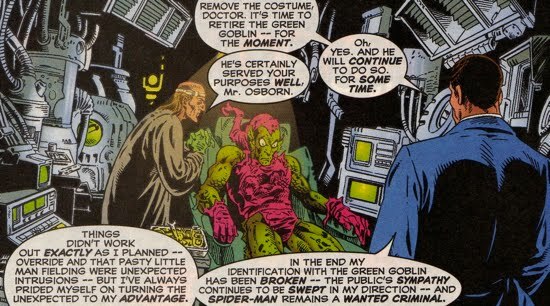 The purpose of this experiment/transformation, funded by Osborn himself, is to create a decoy to fool the public into thinking that the Green Goblin and Osborn are two distinct individuals. 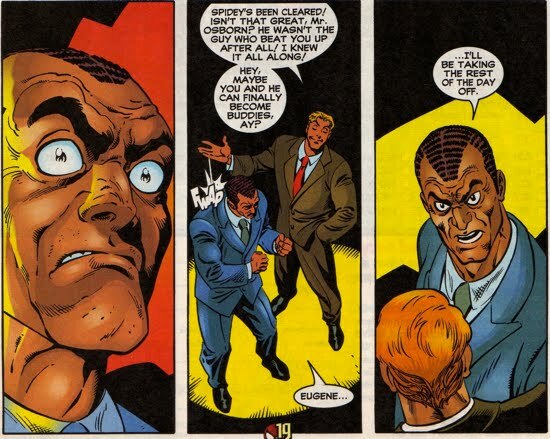 Meanwhile back at the Daily Bugle, Flash Thompson has been hired as Norman Osborn's personal assistant, an opportunity that the former sports star takes very seriously. 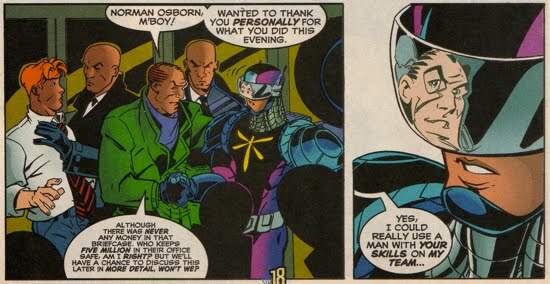 Apparently Osborn admired Flash's ability to face his demons and overcome his alcohol addiction. 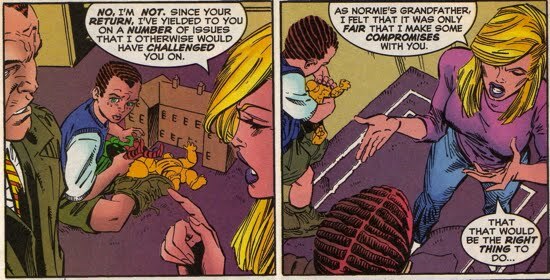 In keeping with Norman's "victim façade", Osborn encourages his daughter-in-law Liz, along with her son Normie, to stay at his estate for safety purposes. Liz refuses Norman's accommodations, citing that it is not a "healthy environment for [her] son." While the two argue, Normie is abducted by someone wearing the Green Goblin attire. When the boy sees the Goblin his first response is, "Daddy?" The young Osborn is taken with little fuss. The news of the Normie's abduction reaches the public fast, and Spider-Man resolves to find the boy despite the huge bounty on his head. When interviewed by television reporters, Norman states, "I hope this will dispel any further rumor that I am connected in any way to this...Madman!" The series events initiated in this plot line are Norman Osborn's first successful attempt to convince the public that he is not nor was he ever the Green Goblin. The story continues in Amazing Spider-Man #432, where things go from bad to worse for Spider-Man. It seems this huge bounty on Spidey's head has hampered other illegal activities throughout the city and therefore affected the livelihoods of both the Rose and Don Fortunato. They then use the Black Tarantula to hunt down and dispose of Spider-Man. Meanwhile, at a junkyard in Brooklyn, Normie Osborn is conversing with his kidnapper and is convinced that the Goblin is his father Harry. 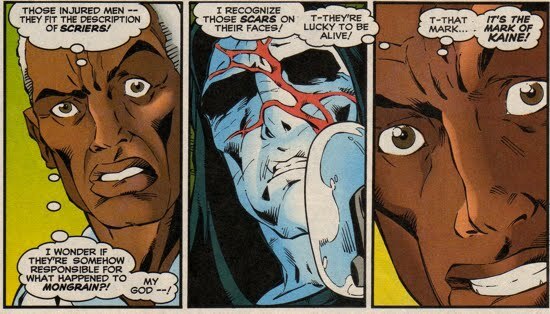 The Green Goblin does not respond to Normie's questions regarding his identity, but Normie feels confident that he is safely in his father's possession. The Black Tarantula eventually succeeds at snaring the wall crawler, but decides not to kill him. His change of heart is prompted by Spidey's noble attempt to save the young kidnapped boy, so he grants Spider-Man a stay of execution. However, he does not leave Spider-Man completely unscathed, before departing the domineering figure removes Spidey's mask to keep as a trophy. Both Norman's innocent front and his private torment of his nemesis Spider-Man are perpetuated further when he hires the Punisher (Frank Castle) to kill the wall crawler in Peter Parker Spider-Man #89. Frank Castle had just turned himself over to the Feds after Luke Cage and Iron Fist helped him take down a neighboorhood drug racket in Heroes for Hire #9. Osborn convinces Castle, who is currently suffering from an amnesia spell, that Spider-Man has gone mad and is in cahoots with the Green Goblin to terrorize his family. While Norman uses the Daily Bugle to publish front page news reports accusing Spidey of collaborating with the Green Goblin for Normie's kidnapping, he continues to make social appearances playing the part of the victim. When Norman and his body guards arrive at Jill Stacy's hospital room, Norman asks Arthur Stacy to aid in finding the person responsible for Normie's abduction. Norman and Arthur share a history, Arthur had investigated the Proto-Goblin's murders in Peter Parker Spider-Man -1. Spider-Man, now wearing a make-shift web mask, is eventually cornered by both the Punisher and a vigilante named Shotgun. Seeing Spidey causes some of the Punisher's memories to return and he decides not to kill him. Right at that moment however, a multi-pumpkin-bomb bomb lands near the trio, the explosion nearly kills all three. The Spider Hunt saga is concluded in Spectacular Spider-Man #255 as Spider-Man narrowly escapes the blast from the Goblin bomb. Osborn meanwhile, gathers notorious bounty hunters together to send after Spider-Man. When the mercenaries question Norman's preoccupation with the wall crawler, Norman responds with cold stares, intimidating the operatives. Back at the Daily Bugle, Flash finds himself defending both Spider-Man and Norman to Liz, stating that both have just been given a "bad rap". 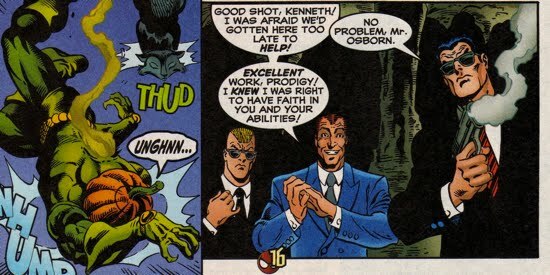 Flash's blind devotion to Norman and his convenient absences when the "decoy Goblin" (aka Green Goblin V) appears make him a potential suspect for Green Goblin V. During another argument between J. Jonah Jameson and Norman at the Daily Bugle, Green Goblin V blasts in through the windows and confronts Osborn. He tells Norman that he wants $10 million for the safe return of Normie and that he wants Osborn to bring him the money at the Brooklyn Bridge. During the dropoff, Spider-Man confronts the Goblin decoy and after a solid thumping, the Goblin “dies” in an explosion. Norman even manage to use his innocent-victim shtick on Spidey to coerce him into rescuing Normie, Spidey almost falls for it. But the moment Spidey took off in pursuit, Norman returned to his vindictive self and went searching for the ransom money. 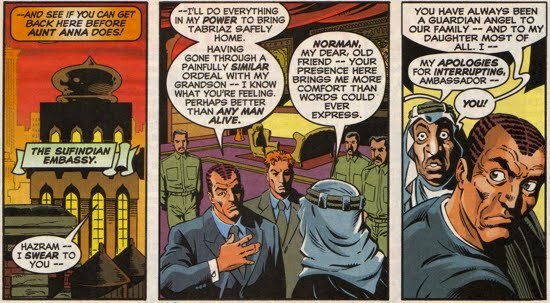 Eventually, Normie is returned to Norman Clarence Fielding, a regular guy who had also helped to keep Spider-Man alive in Peter Parker Spider-Man #89. Norman makes a public announcement thanking Fielding and he also issues credit to Greg Herd (aka Override) for saving him from the clutches of the Green Goblin (his remarks were obviously exaggerated). At the conclusion of the story it is revealed that Norman arranged the kidnapping of Normie by the Green Goblin V in an effort to further sway public opinion away from him being the Green Goblin. Amazing Spider-Man #433 features a development in one of the ongoing subplots featuring Joe Robertson, former Editor-in-Chief of the Daily Bugle. 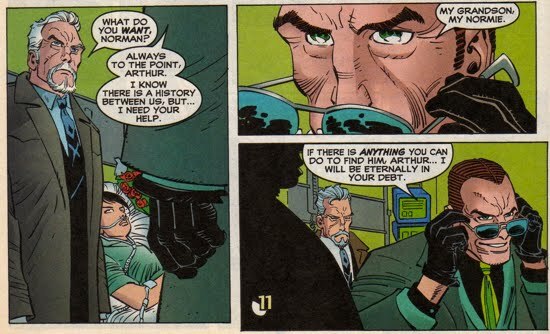 At the farewell party for the editor, J. Jonah presents a monetary gift from Norman Osborn to the former employee. Robertson's wife Martha announces that they will use the money to take a trip to Greece and sail the Aegean Sea. That European trip will have ramifications felt back in the U.S. 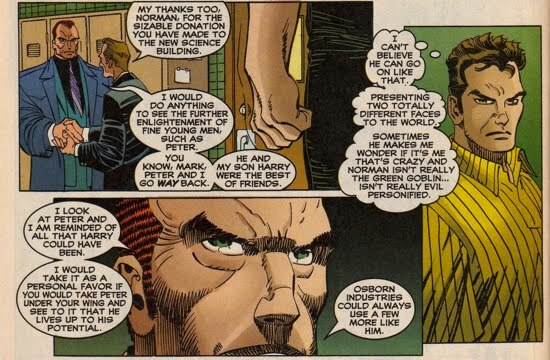 The rift between Jameson and Osborn continues to grow and in Spectacular Spider-Man #256 when Jameson refuses to help with the publication of Norman's memoirs. Norman wants to clear his namesake to the public once and for all with a book that shares "his side" of the story. Jameson rejects Norman's request to have the publisher share "a few memories of [Norman's] warmth and generosity." Ironically, Jameson's refusal prompts Norman to threaten Jameson's wife once again by showing him the copy of her book of poetry, a cold act indeed. Jameson regretfully concedes. As an attempt to minimize Spider-Man's public appearances, Peter adopts few new crime fighting identities, a story arc known as Identity Crisis. One of them, the Hornet, is featured in Sensational Spider-Man #27 when the costumed hero thwarts the Looter from stealing the $5 million in bounty money from Osborn. Norman thanks the Hornet personally and tells the hero that he could "use a man with [his] skills on [his] team". The Joe Robertson subplot continues in Amazing Spider-Man #434 when a postcard from the former editor to the Daily Bugle staff causes a panic for Osborn. As Gloria Grant reads the letter out loud and states that Robertson is on the island of Euboea, Norman storms off frantically. Meanwhile in Europe, Robertson, who is receiving information via the telephone from a mysterious individual, is tracking a yacht owned by Norman Osborn. Concurrently, on a different yacht in Euboea, Alison Mongrain is confronted by members of the cabal Scrier who have been sent to her at the request of Osborn. They inform her that "circumstances now dictate" that she relinquish what Norman had "entrusted to her" in exchange for a sum of money. After the Scriers leave, Mongrain's yacht explodes in a fireball as a mysterious figure watches on. The money given to her by the Scriers must have contained a bomb as well, and it appears as though Norman is tidying up loose ends. He is unsuccessful however, because Alison Mongrain washes up on the shores alive and right into the hands of Robertson. In Amazing Spider-Man #435, the mysterious figure that observed Mongrain's yacht explosion attacks the Scriers, the figure's silhouette matches that of Kaine. Later, at a hospital in Euboea, Robertson sees the aftermath of the mysterious figure's attack on the Scriers, the victims indeed bare the "mark of Kaine". Later as the vigilante Dusk, Spidey saves the Trapster from the Shocker, who was hired by Norman Osborn to kill the villain. The Trapster then confesses to killing Joey Z and framing Spider-Man for the murder at Osborn's bidding. Dusk and the Trapster form an alliance based off of the mutual interest in exposing Norman Osborn. 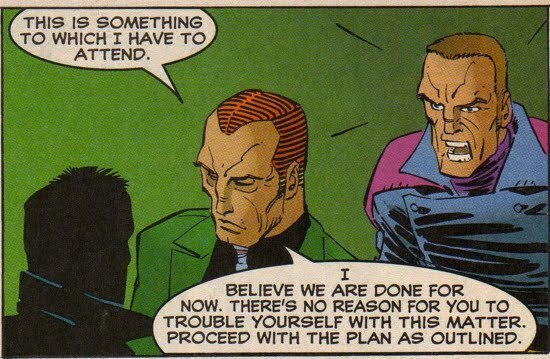 The two eventually break into one of Norman's facilities and confront him, interestingly, Osborn is giving orders to a mysterious individual to "proceed with the plan". This figure is most likely the same pawn operating as Green Goblin V. When the Trapster sees Osborn, he immediately threatens him with physical force. 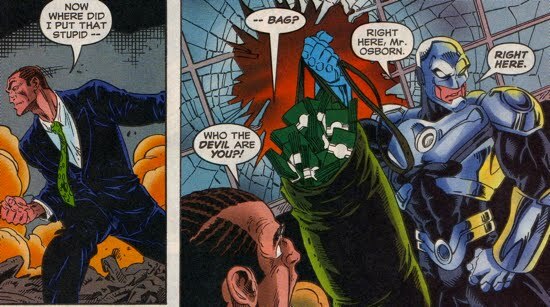 Osborn quickly turns the tables on him though, unleashing his new security team, the Q-4. The Q-4 is an elite team of Russian Nationals steeped in high powered weaponery. Dusk quickly neutralizes the Q-4 and the Trapster "glues up" Osborn, but Osborn is too slick for the Trapster and quickly dissolves the Trapster's chemicals. Peter convinces the Trapster to turn himself into the authorities for the murder of Joey Z. 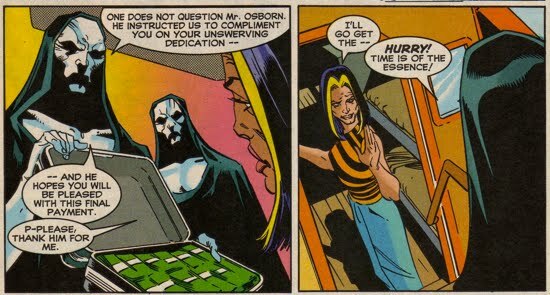 The villain also decides not to expose Osborn, but rather hold that bargaining chip for another occasion. The final chapter of the Identity Crisis saga is featured in Spectacular Spider-Man #257 and Spectacular Spider-Man #258. 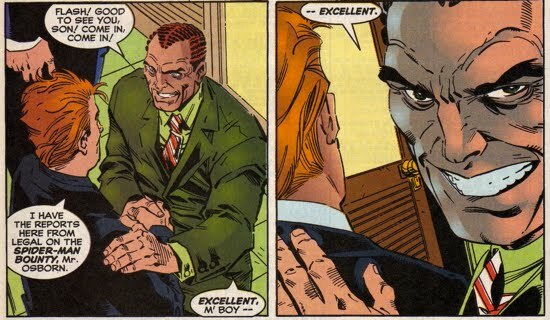 In Spectacular Spider-Man #257, Norman attempts to befriend Prodigy (he was unaware that Parker is Prodigy) so that he could potentially use him against Spider-Man. It is soon revealed that the Sufindian ambassador and Norman Osborn are long time friends, thus Norman offers his services to help find the ambassador's daughter, Tabriaz Chaliz, who was recently kidnapped by Conundrum. The story continues in Spectacular Spider-Man #258 where Peter, as his Prodigy persona, battles with Conundrum and Jack O’Lantern to rescue Tabriaz. Conundrum had kidnapped her in exchange for the priceless Sufindian ruby known as the Hand of Mumthazi. Prodigy eventually defeats the duo and rescuing Tabriaz safely, or so he thinks. When Prodigy is caught off guard by Jack O'Lantern, one of Norman Osborn's body guards, arriving not a moment too soon, shoots and "kills" the pumpkin-headed villain. Norman removes the Hand of Mumthazi from Mad Jack's hand and returns it to the ambassador. 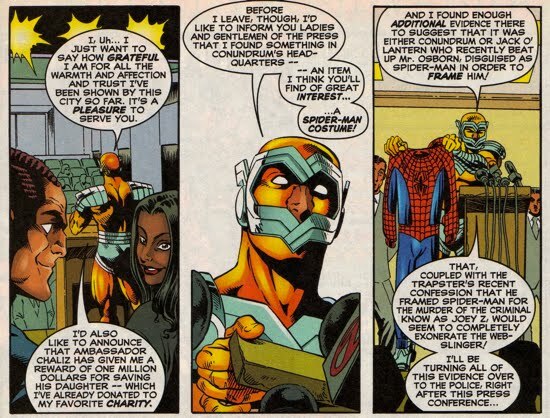 Tabriaz is returned safely to her father as well and Spider-Man gets exonerated by Prodigy, who claims that it was either Conundrum or Jack O’Lantern that disguised themselves as Spider-Man and attacked Norman Osborn at his apartment. This was an unexpected turn of events and not a part of Norman's plan. Norman later admits to Jack O'Lantern, who in fact did not die from the gun shot, that Conundrum's abduction of the ambassador's daughter was unexpected. The plan was for Norman to return both Tabriaz and the Hand of Mumthazi, which Osborn had secretly stolen. Spider-Man is no longer a wanted criminal, for now, and the Identity Crisis story arc comes to an end.